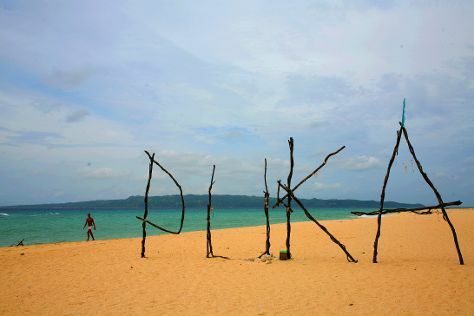 Start off your visit on the 16th (Wed): enjoy the sand and surf at White Beach, then enjoy the sand and surf at Yapak Beach (Puka Shell Beach), then kick back and relax at Diniwid Beach, and finally buy something for everyone on your list at E Mall. On the 17th (Thu), you'll have a packed day of sightseeing: tour the pleasant surroundings at Ilig Iligan Beach, then soothe aching muscles at some of the top local wellness centers, and then tour the pleasant surroundings at Balinghai Beach. To find photos, other places to visit, traveler tips, and other tourist information, go to the Boracay trip itinerary site . If you are flying in from Philippines, the closest major airport is Kalibo International Airport. In January in Boracay, expect temperatures between 30°C during the day and 26°C at night. Wrap up your sightseeing on the 17th (Thu) early enough to travel to Manila. The capital of the Philippines and the "Pearl of the Orient," Manila truly resembles a gem: rough on the outside, but glittering within. Start off your visit on the 18th (Fri): see the interesting displays at National Museum, then admire the masterpieces at San Agustin Church, then take in the spiritual surroundings of Manila Cathedral, and finally contemplate the long history of Fort Santiago. To find reviews, traveler tips, and tourist information, use the Manila road trip planning tool . Do a combination of ferry, flight, and bus from Boracay to Manila in 3 hours. Alternatively, you can do a combination of ferry, bus, and flight; or do a combination of ferry, taxi, and bus. When traveling from Boracay in January, plan for a bit warmer days and about the same nights in Manila: temperatures range from 35°C by day to 27°C at night. Finish your sightseeing early on the 18th (Fri) so you can travel to Beppu. Kick off your visit on the 19th (Sat): stop by Angel Kimono Rental Beppu, then view the masterpieces at Select Beppu, then view the masterpieces at Beppu City Traditional Bamboo Crafts Center, and finally soak in some Japanese tradition at some of the top local onsens. For more things to do, traveler tips, maps, and other tourist information, use the Beppu road trip app . Traveling by combination of bus, flight, and train from Manila to Beppu takes 8.5 hours. Alternatively, you can do a combination of bus and flight. The time zone difference when traveling from Manila to Beppu is 1 hour. Traveling from Manila in January, expect Beppu to be cooler, temps between 11°C and 3°C. Cap off your sightseeing on the 19th (Sat) early enough to go by car to Fukuoka. On the 20th (Sun), admire the masterpieces at Fukuoka Asian Art Museum, see the interesting displays at Fukuoka Citizen’s Disaster Prevention Center, and then pick up some local products at Osakana Tengoku. To find traveler tips, where to stay, photos, and tourist information, read our Fukuoka trip builder site . Drive from Beppu to Fukuoka in 2 hours. Alternatively, you can take a train; or take a bus. In January, daily temperatures in Fukuoka can reach 11°C, while at night they dip to 2°C. Finish your sightseeing early on the 20th (Sun) so you can travel back home.